The 10th Annual A Pair to Remember luncheon raised over $150,000 for Easterseals Florida. 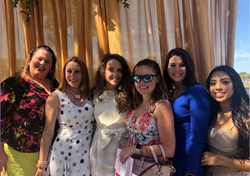 The MaintenX ladies enjoyed a day celebrating fashion and Easterseals, which supports families that have children with physical and intellectual delays. Giving back to the community is a core part of MaintenX International’s company culture. That culture expressed itself on Friday when Tampa-based MaintenX, one of the largest facility maintenance and repair companies in the US, was recognized as a Silver Sandal sponsor of the 10th annual A Pair to Remember Luncheon, which raised more than $158,000 for Easterseals Florida. In all, MaintenX attendees raised more than $7,000 for the event, and also had a great time. One MaintenX attendee won a raffle basket with a variety of gift cards to local restaurants, while another made the winning bid for a live-auction package that included party planning services and – signature to the event – a pair of shoes. In addition to A Pair to Remember, in the past year MaintenX has supported charitable organizations including the Humane Society of Tampa Bay, Salvation Army Angel Tree, and Skills Center of Tampa. MaintenX is also currently sponsoring a Habitat for Humanity home in Largo, FL, for which the team will supply more than 200 volunteer hours in addition to financial support. When facility managers need help with their building, whether it be scheduled maintenance or emergency repairs, they trust the skilled technicians at MaintenX. To learn more about MaintenX, visit http://www.maintenx.com.